What is your venue capacity? Our venue is approved for 450 pax. Can I book a site tour to view the venue? How can I secure a booking with the venue? 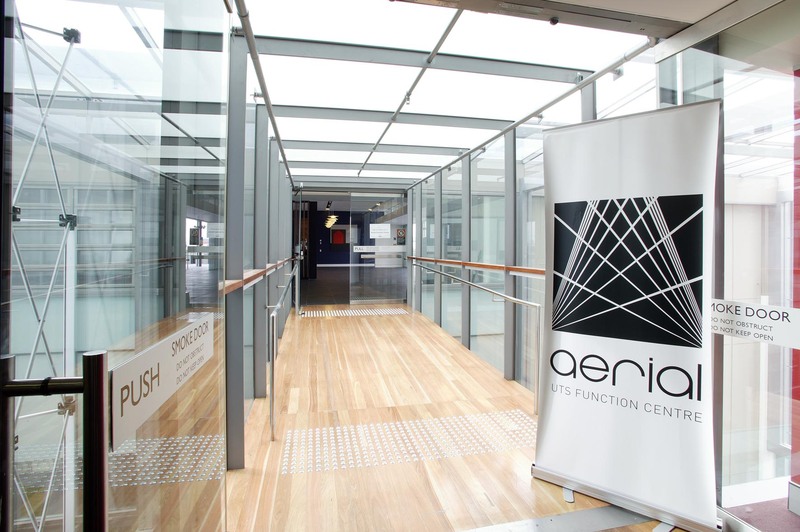 The easiest way to secure your booking is to call our office on 02 9514 1632 or email aerialfunctions@uts.edu.au to check availability and book in your space. A contract will be emailed through to you for your approval. Upon return, a 25% deposit invoice sent for payment prior to your event date to confirm your booking. Our cancellation policy is outlined below. All cancellations are required to be advised in writing. Over 60 calendar days prior to the in-house function or off site catering delivery, any deposit paid will be forfeited. If no deposit has been paid yet, a charge of 25% of the expected revenue and room hire for the function or catering delivery will be applied. Between 60 calendar days and 31 calendar days prior to the in-house function or off site catering delivery. The deposit is forfeited and an additional charge of 20% of the total expected revenue and room hire (if applicable) will be applied. Between 30 calendar days and 15 calendar days prior to the in-house function or off site catering delivery. The deposit is forfeited and an additional charge of 40% of the total expected revenue and room hire (if applicable) will be applied. Between 14 calendar days and 7 calendar days prior to the in-house function or off site catering delivery. The deposit is forfeited and an additional charge of 60% of the total expected revenue and room hire (if applicable) will be applied. Less than 7 calendar days prior to the in-house function or off site catering delivery, 100% – includes deposit of 25% – of the total expected revenue and room hire if (applicable) will be applied. Bump in/out access can be arranged as required. This is dependent on availability and fees do apply. We are located in the heart of the UTS Campus at Broadway. Located in the old Fairfax Building, the function centre is located on level 7 of Building 10, 235 Jones St.
Interpark manage a car park that is located underneath Building 10. Does your venue have disabled access/facilities? The Function Centre is fully accessible via ramps and lifts to level 7 with an accessible bathroom available. Our venue is also s equipped with a hearing induction loop, please advise if this is required on your event day. Do you have any affiliations with nearby hotels? Please contact your Functions Coordinator for competitive hotel rates and hotel recommendations that are in close proximity of Aerial UTS Function Centre. Absolutely. Please speak with your Function Coordinator so that we can advise on the best selections for your event. No. As we are an Accredited Gold Licence Caterer we pride ourselves on the catering services we provide to our clients that come to our Venue. For any specific catering requirements, please talk to us so that we can work on meeting your event requirements. Does security need to be hired for each event? For events involving over 50 attendees and alcohol served, we will recommend security be engaged to supervise events. Please speak with your function coordinator for further details. Do you allow external providers? Depending on your event requirements, we have trusted suppliers that have worked in our venue and know how to make your event spectacular. If you have a specific company that you would like to work with, please speak with your Function Coordinator to discuss. What is going on outside!! ?